Contact | All Year Inc. Thank you for taking interest in our services. All Year, Incorporated will not be where it is now if it were not for the trust that customers like you have given us. We always keep the quality of our service at top of the market standards so that you will be receive nothing but the best from All Year Sacramento. All Year Sacramento offers unrivaled services in heating, ventilating, and air conditioning services. We also have options to go green by utilizing renewable energy sources like solar and geothermal. We install, service, maintain, and repair almost all brands and models of systems. We also offer home performance assessments especially on energy efficiency. We can help you take advantage of home improvement programs that can give you lots of savings through rebates and tax credits, as well as financing with measly interest rates. It’s about time you made your home energy efficient! Contact us now and see how we can change the way you live. With our topnotch services, you are assured that our services are worth every penny you spend. And with the savings you’ll get through different rebates for going green, it’ll be like your updates are paying for themselves! New HVAC Installation. Yearly Maintenance . . . . Service. Replacement (Furnace, A/C, Heat Pump). PV Solar. Solar Thermal. Ductless Mini Splits. Radiant Heating. Geothermal. Duct Cleaning. . Air Filtration. Air Purification (UV Light). Zoning. Water Heaters. Home Performance Assessment. We are looking forward in hearing from you. Should you have inquiries on our products and services, or if you want to set up an appointment with one of our experts, call us at our Sacramento Office (916) 922-7796. You can also send us a fax message at (916) 922-7835. We are available for estimation services any day of the week, and even in the evening. 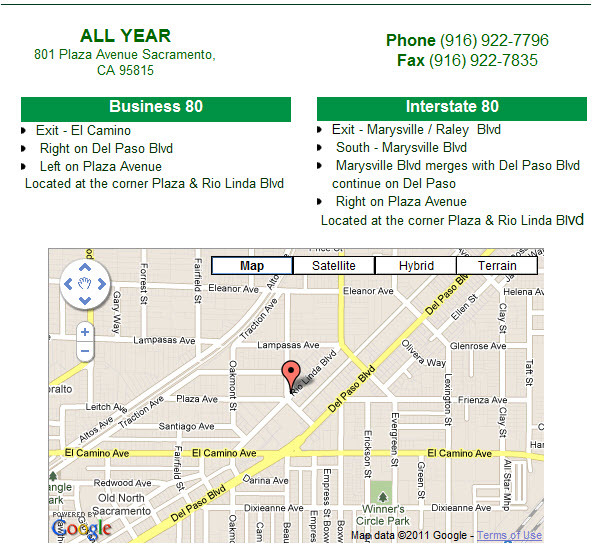 Should you wish to visit our office, you can find us at 801 Plaza Avenue, Sacramento, California. We are located at the corner of Plaza Avenue and Rio Linda Boulevard. You can also reach us through email. For General Information, send a message to info@allyearah.com. 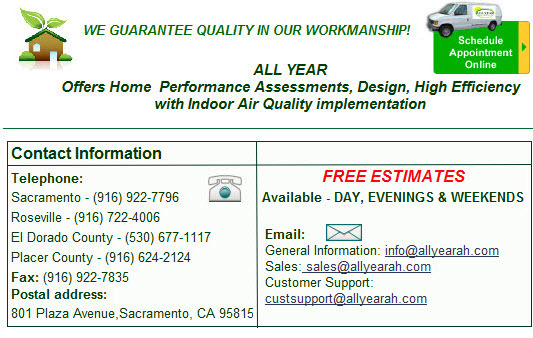 All Year, Incorporated is a Heating, Ventilating, and Air Conditioning installation, service, and repair company in Sacramento. All Year also services the following locations: Antelope, Applegate, Auburn, Broderick, Cameron Park, Carmichael, Citrus Heights, Davis, El Dorado Hills, Elk Grove, Fair Oaks, Folsom, Gold River, Granite Bay, Grass Valley, Lincoln, Loomis, Newcastle, North Highlands, North Sacramento, Orangevale, Penryn, Pleasant Grove, Rancho Cordova, Rancho Murieta, Rio Linda, Rocklin, Roseville, Sacramento, Shingle Springs, West Sacramento, Wheatland, Yuba City.